Help Refugees are pioneers in humanitarian aid. Set up by a group of friends, they support over 80 projects across Europe and the Middle East. In just two and a half years they have helped over 722 thousand people. They fund women and children's services, medical care, search & rescue, food provision and informal education. Their award-winning model allows an unprecedented 94% of the funds they raise to go directly to the projects helping the most vulnerable. No big salaries or fundraising budgets, just people helping people. Choose Love is their simple, powerful message. For Wilderness 2018 we helped to spread the Choose Love message with a limited edition exclusive Wilderness X Choose Love t-shirt, based on Katharine Hamnett's iconic design. If you missed your chance to buy these on-site, fear not, they are still available to buy on ASOS here but for a limited time only so get them before they're gone. 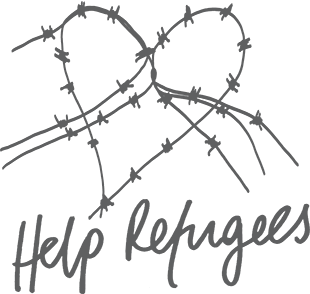 We are thrilled to announce we will be partnering with Help Refugees again this year. Full details on this will be announced later in the year. In an Emergency: When disaster strikes their first priority is to start saving lives. They help provide clean drinking water, sanitation, food and the essentials needed for those affected to survive. Before helping people to rebuild their lives and communities and come back stronger, better preparing them to cope with shocks and uncertainty and face the future on their own terms. Currently responding to both the Yemen and Bangladesh Ronhingya Crisis. For the Long Haul: Working at grassroots level, promoting development, helping people to help themselves out of poverty - supporting their right to work and provide for their loved ones. Focusing on advancing women's rights and building fair livelihoods for all. Speaking Out Together: Making sure the voices of the world's poorest people are heard loud and clear, from Downing Street to the World Bank. Bringing their passionate supporters together to take action on big issues that keep people poor, like inequality, climate change and hunger. Challenging the systems and institutions that are the cause of the injustice of poverty, to ensure lasting change. We partner with Oxfam to provide our stewarding service. As one of our stewards, you will be part of a large team representing Wilderness and Oxfam to the festival goers. You'll provide essential roles on site to ensure the festival runs smoothly and the festival-goers are safe. Apply to be an Oxfam Steward at Wilderness 2019. We will once again be partnering with CALM the Campaign Against Living Miserably. This amazing charity's main goal is to prevent male suicide – the single biggest killer of men under the age of 45. Out of the 6,109 suicides in the UK in 2014 4,623 of them are men – that’s 76%. This is more than drugs, knife crime, gun crime, traffic incidents. They believe there is a culture barrier preventing men from seeking help and are trying to break this. More information on how we will be working with CALM at Wilderness 2019 will be available later in the year. Camerados is a new social movement that believes we need 2 things to get through hard times: Friends and Purpose. They believe the best way to get these is to look out for each other because when you are having a tough time and you are there for someone else you get a great sense of purpose and you have a friend. Anyone can be a Camerado and they are popping up all over the world, wearing their Camerado badge proudly. Some also create Public Living Rooms – spaces to be a Camerado. Just somewhere to be alongside each other, to be a bit rubbish on a bad day, to have fun, to just be. Equals, no judgement, no fixing and everyone welcome. Last year Camerados brought one of these Public Living Rooms to Wilderness with huge success and this year we are delighted to have them back. More details on their 2019 involvement will be available soon. Festivals are collectively responsible for 15 Kilotonnes of carbon dioxide emissions each year. We all want festivals to continue but we don’t want to have such a massive impact on the earth – Energy Revolution focus on finding a solution for this. For the second year running you have the option to donate £2 to Energy Revolution when you book your Festival Tickets and support renewable energy projects. This small investment will account for the carbon emissions from their journey to and from the festival. Last year we balanced 23,709 audience travel miles (7,320 kg CO2e) this way. With over 50 members this amounted to 2.8 million miles balanced in 2018, proving that together we can turn travel into clean energy, and a problem into a solution. Their current goal is to balance 10 million miles by 2020, with proceeds going towards @solar4schools, a project that helps schools install solar panels & teaches children about a low carbon future. So, if you are planning to travel to Wilderness by car, please consider supporting them in this incredibly worthwhile goal by balancing your journey. Turn fossil-fuel travel miles into clean, renewable energy so we can keep the party going forever. Love Support Unite, is a grass roots foundation started by 2 sisters that establishes small-scale projects that can be sustained and replicated throughout Malawi to trigger change on a large scale. They work directly with poverty-stricken communities with the goal to empower people to change their own lives rather than creating dependence on a charity. Giving people a leg-upraher than a hand-out. The model creates a blueprint that can be replicated in Malawi and across the world, offering the potential to create self-sufficient, prosperous and empowered communities. Education: Creating sustainable Schools, feeding all pupils, surplus crops pay for materials. Funding 8 volunteers through teacher training. Adult literacy and computing classes. Secondary education and university sponsorship. Mother-Baby Wellbeing courses. Business and permaculture training. Enterprise: Providing vulnerable families with 0% microloans alongside business training. Forming women’s cooperative enterprises. Running a medical outreach across 8 areas a month. Teaching nutrition through Family Futures and Sustainable School. Improved Access to Clean Water: Installing boreholes for clean drinking water and drip irrigation. Providing training in water harvesting for effective crop development. Solar Power: Installing solar power in the communities, facilitating evening study and the ability to generate revenue through solar phone charging. Why not find them on site and take part in their Junkyard Golf Challenge. Learn more about this amazing charity and potentially win prizes, what could be better? Every year we partner with Festival Spirit, a charity providing the full festival experience to young people who would not normally be able to attend and enjoy due to life-limiting illness or disability, our guests. They provide 'buddies' to assist guests and their carers to get around the festival site and to make the most of the weekend event, see bands and attend all the other exciting workshops and activities on offer. Each group stays in a wonderful colourful marquee and enjoy the full festival experience. Accommodation includes: Full electric hospital profile beds for each guest, curtained off private sleeping area for each guest and their carer, hard flooring for ease of wheelchair access, hoists, shower chair / commodes, heating, electricity, camp beds for carers and buddies. They will also be on site all weekend in the Accessibility Campsite for anyone who would like to visit them for more information. The Thomas Gifford Trust is a local charity dedicated to the Charlbury Town and the surrounding area. It works on different community projects that are relevant at the time. For the past 10 years they have been raising funds for and managing the construction of the Charlbury Community Centre which opened on 9th September 2017. To thank this wonderful community for the part the play in making Wilderness happen please consider donating £2 to this extremely worthwhile charity when booking your festival tickets. Once again we are proud to be partnering with ROSY – Respite nursing for Oxfordshire’s Sick Youngsters. This fantastic organisation raises funds to boost the extremely limited resources of Oxfordshire’s Children’s Respite Nursing Team. The team offers respite nursing to terminally, acutely, or chronically ill children and babies in their homes. The Oxford Food Bank has two purposes: feeding the community and protecting the environment. At Wilderness they collect: fresh fruit and veg, dairy and bakery items, boxed items, soft drinks and non-perishables from traders, restaurants and bars, and distribute it free of charge to local charities, ensuring the food gets to the right people and reducing food poverty. This also reduces food waste in the local area, lessening environmental impact. Most of their operations are carried out by volunteers, helping them to provide around £20 of food for every £1 donated. In 2018 our partnership with Oxford Food Bank prevented 5 tonnes of festival food going to landfill, instead distributing it to around 80 charities in Oxford.